At his first appearance in Philadelphia at the Cathedral Basilica of Sts. 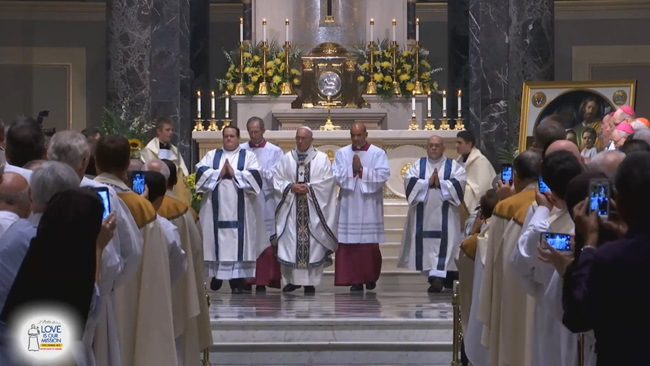 Peter and Paul, Francis celebrated mass for the men and women religious of the archdiocese of Philadelphia. Francis paid tribute to the many generations of Catholics who have faithfully been committed to the local church here. He used the example of Philadelphian St. Katherine Drexel and Pope Leo XIII’s question to her: “What about you?” to reflect on the Church’s mission—and all of our mission—to work together and respond to the needs and challenges in our world today. It was a call for the religious to reflect upon their own vocations and not lose sight of their primary task, which is to engage with the laity and to do so with joy. In particular, he called for greater care for those preparing for marriage and young people. Click here for the full text of the homily.